Similar to 'Generation B' by Harold Lohner, as found in the MLP:FiM logo. And why there are the lyrics of F.U.N. Song from SpongeBob in the preview image? 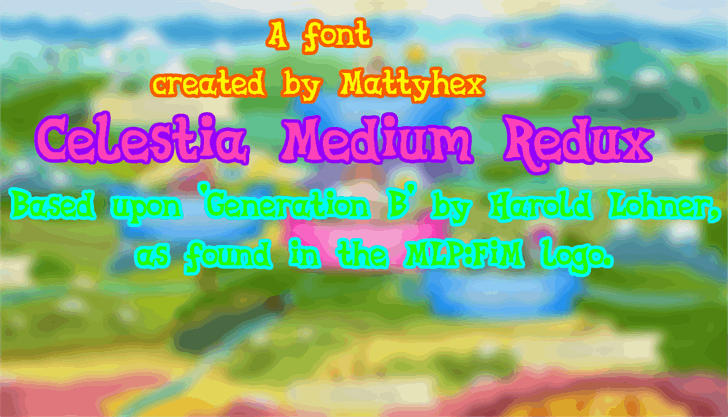 Based upon 'Generation B' by Harold Lohner, as found in the MLP:FiM logo.<br><br>Orignal Celestia Medium created by Purple Tinker, redux by Mattyhex; FontForge and Inkscape. Based upon 'Generation B' by Harold Lohner, as found in the MLP:FiM logo.<br><br>Orignal Celestia Medium created by Purple Tinker, redux by Mattyhex; FontForge and Inkscape.<br><br>Alternative 'I' version.